Academic Computing Services provides Vassar faculty, staff, and students whose computational needs are not sufficiently met by the resources available to them in their lab or department with high performance computing support. There are several different types of systems available, both on and off campus, for those in the Vassar community requiring more powerful computing resources and technical support. A consultant is available to work with you to determine the most appropriate resource to match your project needs and assist with obtaining access to those resources. Vassar has its own high performance computing (HPC) cluster, known as Junior. It is housed on campus and is managed by the Asprey Center for Collaborative Approaches to Science. The cluster consists of a head node and three compute nodes running the Ubuntu 14 operating system. For more information, contact ACCAS Director Jill Schneiderman. Gordon supercomputer at the San Diego Supercomputer Center. 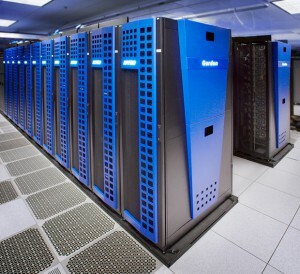 The Extreme Science and Engineering Discovery Environment (XSEDE) is an NSF-funded consortium that supports a network of 16 supercomputers housed at major U.S. research institutions. Through XSEDE, member institutions gain access to flexible pools of time on large supercomputers. Resources include High Performance Computing (HPC) machines, High Throughput Computing (HTC) machines, visualization, data storage, and technical expertise to help researchers do computer-dependent science and scholarly work more quickly and effectively. For more information on available systems and support, visit the list of XSEDE resources. Startup: Startup projects target new users planning to submit more substantial requests in the future, as well as users who have modest computational requirements that, nevertheless, cannot be satisfied by their campus resources. Education: Education projects target faculty or teachers intending to use XSEDE-allocated resources for classroom instruction or training classes related to the use of advanced cyberinfrastructure technologies. Research: Research projects are designated for projects that have progressed beyond the startup phase and are conducting production usage of XSEDE-allocated resources in pursuit of their research objectives. To learn more about XSEDE or to get an XSEDE account, contact Chris Gahn (x7866 or chgahn@vassar.edu) in ACS. Amazon Web Services (AWS) provides on-demand computing resources and applications via the internet, with pay-as-you-go pricing. For projects requiring either short-term or intermittent computing needs, AWS may be the right solution. Academic Computing Services, in consultation with the CIS Cloud Services Architect, can help you get started with Amazon Web Services.